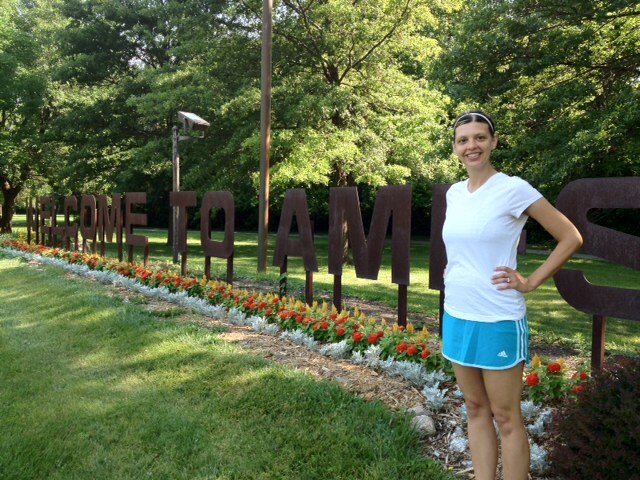 I’m not really sure what I was thinking when I agreed to run Ames, IA and write a blog post for A Good Run. I’ve never been a “good” runner and have to work at it consistently to build mileage and stamina. And, I’ve been on a hiatus from running for about nine months (I took a break somewhere during my first trimester when morning sickness kicked in). But, I did go out there and do the run. I wasn’t out to set a PR or even run at my “typical” pace. I did what I could during this run, and I’m perfectly okay with that. It was something Steve and I could do together with Cal for his blog. I appreciate Cal putting up with our shenanigans. I will admit, when we left the house I was focused on me…making sure I had everything I needed to run. Cal made it out of the house himself with a burp cloth. 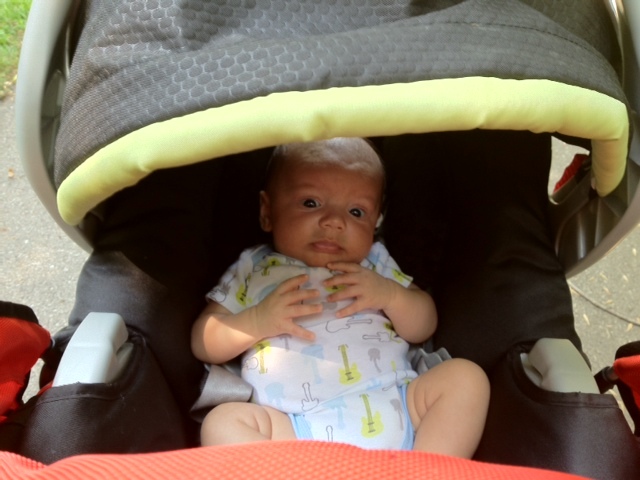 If I could go back and change one thing, that’s probably what it would be…make sure you have some essentials for your 7 week old son (well, and maybe the ridiculously hot weather). At the end of the run, though, we did alright. I spent four great years as a collegian living in Ames. If you would have told me I would move back to Ames someday and call it home, I probably would have laughed. However, last year, Steve and I had the opportunity to move back to the city that we both loved so much to make our home and start our family. We’ve love every minute of it and truly enjoy being “home.” I’m excited to showcase during this run one of the greatest things Ames has to offer, Iowa State University. 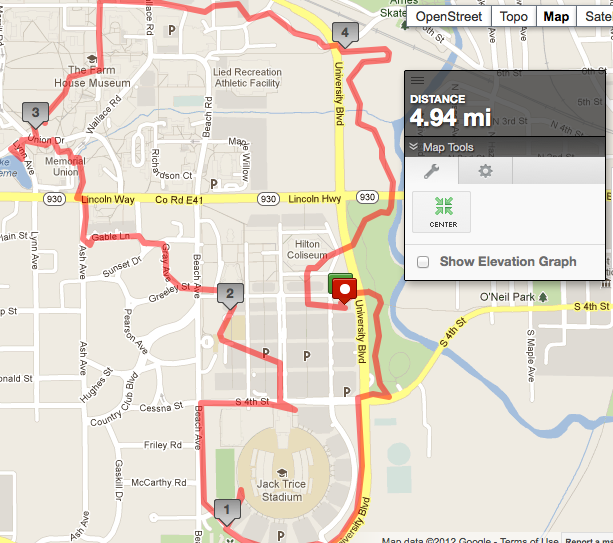 This running route takes you in and around the beautiful campus. With that, I’d like to welcome you to Ames! 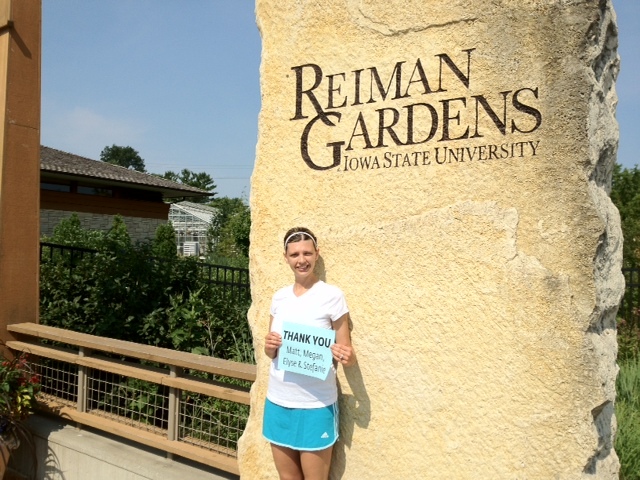 The first stop on the route was Reiman Gardens. Reiman Gardens is a striking entrance to Iowa State University and the city of Ames. It is one of the largest public gardens in Iowa and has many award winning features. In my eyes, Reiman Gardens is an outdoor, interactive classroom. It is for this reason, I want to thank some of my former graduate students- Matt Ferguson, Megan Gonzalez, Elyse Gambardella and Stefanie Burke. I am so thankful to have crossed paths with these four individuals. Because of them, I shared in lots of laughter, tears, thoughtful discussions, reflection and truly learned so much. I am so proud to not only call them colleagues but friends. Although I don’t see them very much, I think of them often. The second stop was at Jack Trice Stadium, the Iowa State football stadium named for Iowa State’s first African-American athlete. I am proud to be a Cyclone and enjoy watching them play. Tailgating and attending football games has once again become a part of our Saturdays in the fall. It is here I thank my parents as my mom is a fellow Iowa State alum, and my dad is a longtime high school coach. My parents have always encouraged and supported me to define the true me. They allowed me to explore my own opportunities and discover the paths that I thought were best by helping to open doors or keep them open instead of closing them. They always showed confidence in me with unconditional love. I love you Mom and Dad! 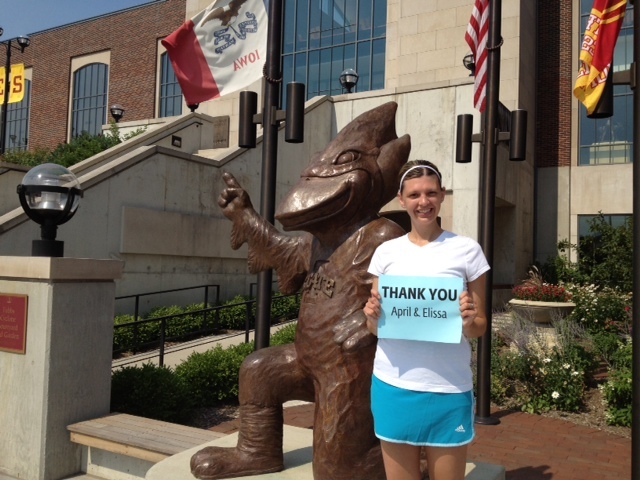 Next, we stopped at the ISU Alumni Center. This is not only where I work but also where one of my favorite statues resides, the bronze Cy. I have worked for the Iowa State University Alumni Association for almost a year. I love what I do because I get to connect with people on a daily basis that share my excitement for ISU. It is here that I thank two of my former colleagues, April Robles and Elissa Christmas. I couldn’t have asked for any better colleagues while at Miami University. April’s positive outlook and optimism is something I admire. April always took the time to help me become a better professional and would listen to what I wanted or needed. Besides being a wealth of knowledge and a great resource, Elissa was my sounding board, confidant and friend. I miss them both daily. 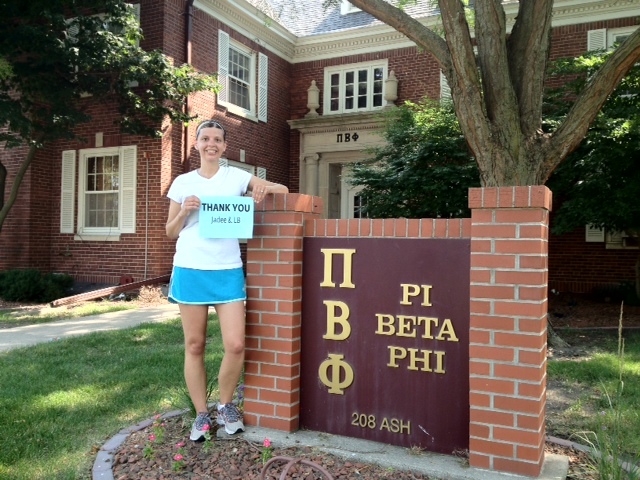 From the Alumni Center, we headed to 208 Ash Ave., home of Pi Beta Phi. I lived here for two years while at ISU with more than 90 of my sisters. A lot of great memories took place here with many great woman. This seems like the perfect place to thank my true sisters, Jadee and Lauren. Jadee is my oldest sister and currently lives in Washington, DC. Lauren is a year older than I am and lives near Des Moines, IA. We may not have agreed on everything through the years, but I always know I can depend upon them. They are always there to pick me up, answer my phone call, laugh at my silliness and tell me they love me. Both are a strong, confident woman in their own way, and I would be lost without them. After Pi Phi, we headed towards the Memorial Union, the student union on campus. We opted for the shady route to get there. 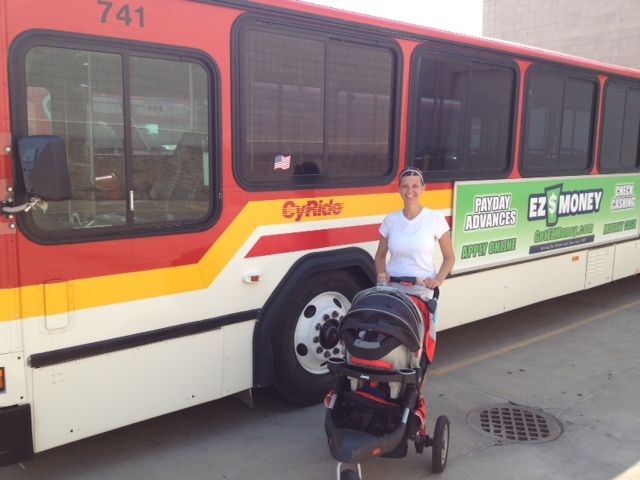 While it was a nice reprieve from the blazing sun, we did have to do a little off-roading with the stroller to get there. It was a good cross-training workout for us and Cal slept right through it. 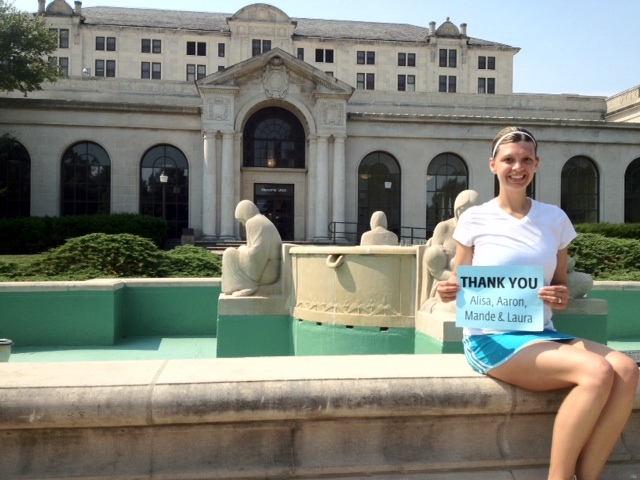 When we reached the Memorial Union, we paused outside by the Four Seasons Fountain. This fountain is one of the several pieces of public art on campus created by Christian Petersen. It is here that I would like to thank those that aided me in discovering the field of student affairs: Alisa Frandsen, Aaron Haight, Mande Adams and Laura Bestler. Each of these women played a key role. I am grateful for each of these women and the impact they had on my professional and personal life. We crossed the street from the Union to get to the campanile. “Campaniling” is one of Iowa State’s traditions. It is said that a student officially becomes an Iowa Stater when he or she is kissed under the campanile at the stroke of midnight. 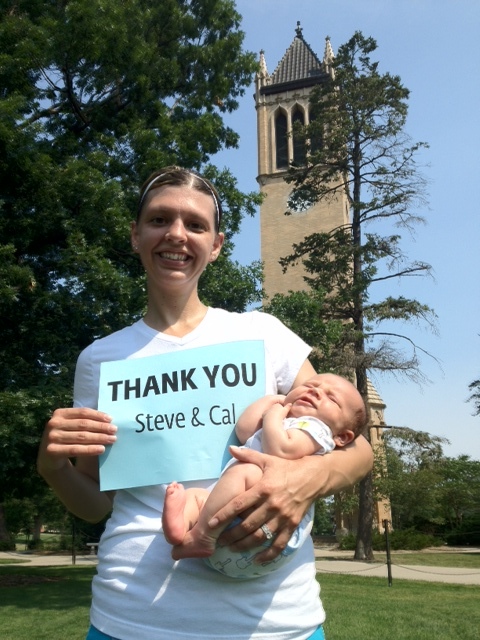 It only makes sense that I thank my husband, Steve Good and our son, Cal at this stop. Most of you know something about Steve already. If not, just keep reading this blog and you’ll learn. He is an amazing man who is innovative, passionate and generous. He has a desire to continually learn and isn’t afraid to go after his dreams. He is also a great dad. Cal and I couldn’t have asked for a better man. And Cal, well, he’s just amazing and beautiful. 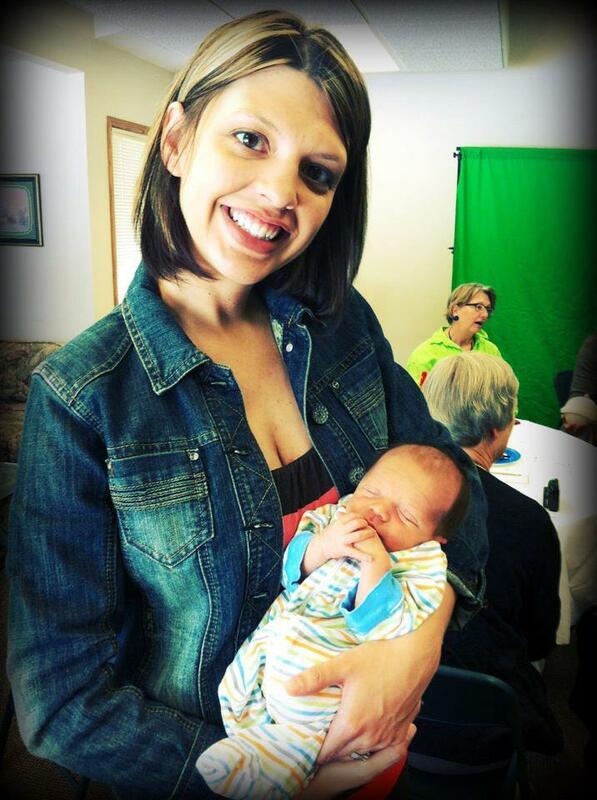 A true blessing. We continued to wind our way through campus to get back to where we started. 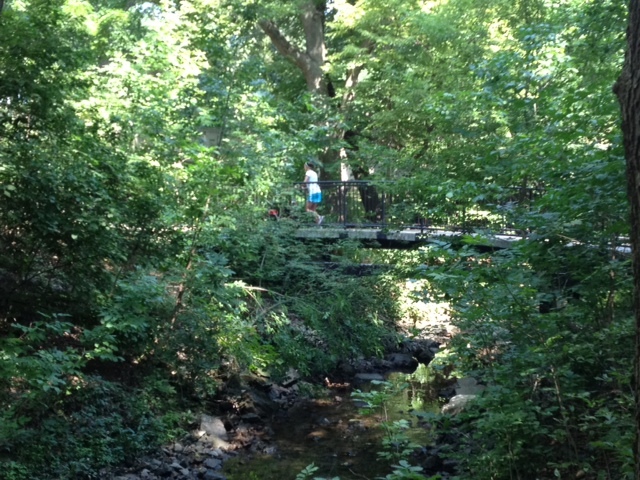 This was the longest leg of our run. It was here that we seriously considered flagging down a Cy-Ride with air conditioning to get out of the heat. But, we continued on. 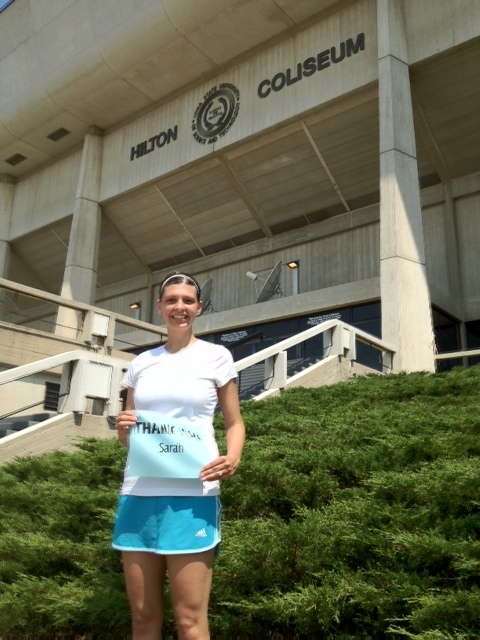 Our final destination was Hilton Coliseum. Hilton is home to Cyclone basketball, volleyball, gymnastics and wrestling. It is also where “Hilton Magic” takes place. This is the power of Coliseum faithful to produce unexpected victories. This first happened in 1989 and is still applicable today. It is here that I thank Sarah Wechsler. Sarah and I became friends because of our husbands. We hit it off and I can’t imagine my life without her. We’ve gone through some major life events together (wedding, pregnancy) and she is always my voice of reason and sanity. After we finished our loop, we felt we should probably go home and shower before we grabbed some lunch or we might clear the whole place out from our lovely smell. 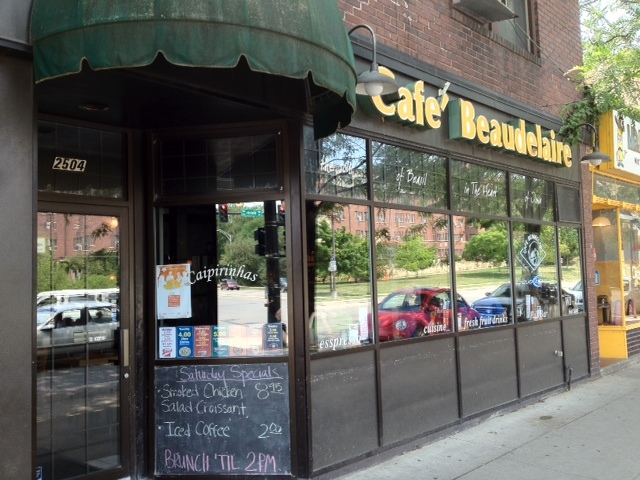 We decided to refuel at Café Beaudelaire which is a quaint, Brazilian restaurant right near campus. Their sandwiches are good but their fries are amazing. 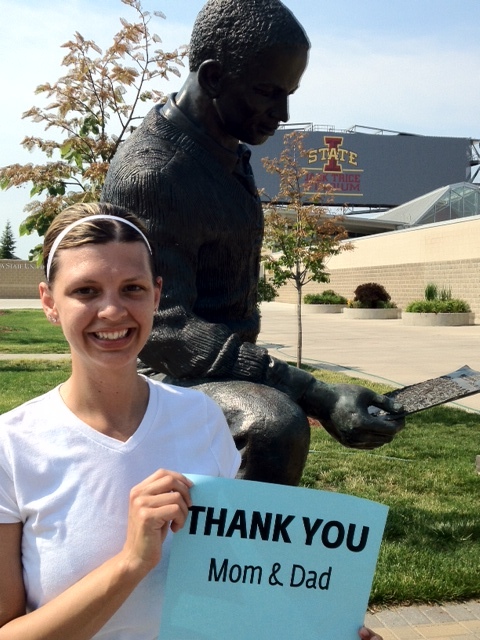 As we wrap up this run in Ames, I wanted to give back to something that impacts my community. My charity is United Way of Story County. The vision of UWSC is to improve the quality of life in our community for individuals and families. UWSC impacts Ames and the surrounding communities on a daily basis through their community partners and support of over 90 core programs. Along with changing the scenery of the workouts, they use unique equipment (i. How beneficial to know tools like wrenches and ratchets. ‘kei’ (light weight), ‘kei tora’ (a variation of ‘kei truck’), and micro trucks.